I must admit that few things make me happier than sharing good food with my favourite people. My ‘internet friends’ have become a big and special part of my life so enjoying a meal together with them is now considered a mealtime very well spent. It can sometimes be incredibly hard with big groups to choose a restaurant that pleases all, whether it be for dietary reasons, cuisine preferences, price point, or the fact that someone’s already blogged it, so when it came to light that most of us had not yet been but really wanted to go to Shackfuyu, it was the obvious venue of choice for our blogger date of nine. I was joined by the lovely Tahira, Mehreen, Lauren, Angie, Sheepa, Aftab, Gary and May for a Tuesday evening of serious feasting. 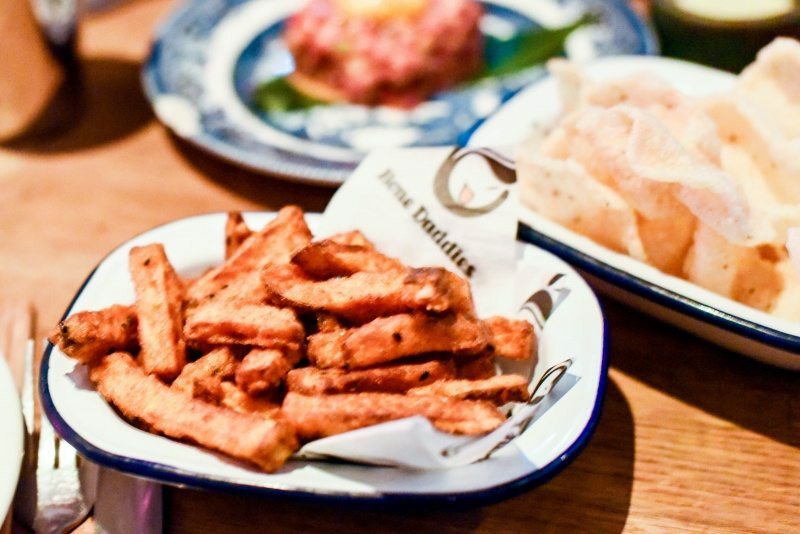 Shackfuyu is brought to us by the same owners of the hugely successful Bone Daddies and Flesh & Buns, and serves ‘Yoshoku food’, a Japanese take on Western cuisine, which is by no means authentic, but still utterly delicious. 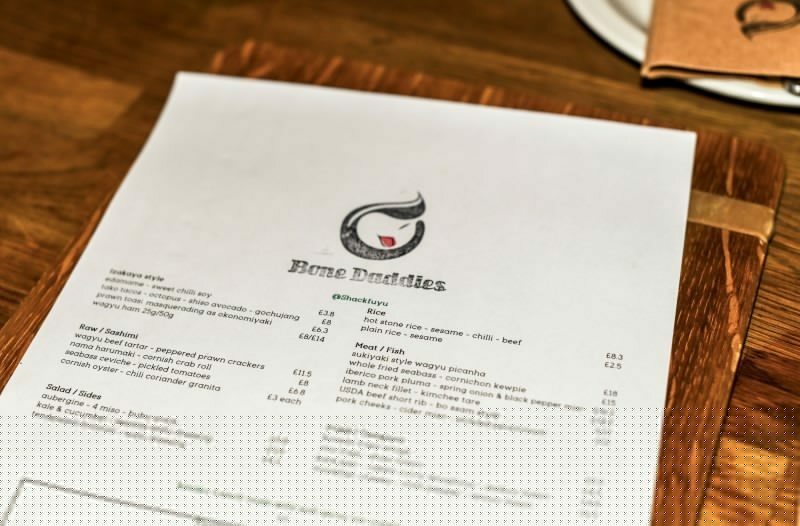 In addition to the food being damn tasty, it’s also excellent value, with a very generous set menu costing only £30pp (which I think is the best & cheapest way to enjoy a meal both here and at Flesh & Buns, where the bill can rack up quite easily otherwise!). Before I compliment the food however I must make mention of the fact that the Manager was an absolute arse, making it seem like we were asking him to turn the world upside down when two of our group wished to exchange some of the dishes on the set menu for pescatarian/vegetarian options, at which point he (very rudely) tried to tell us that the set menu must be taken by the whole table or none of the table. We got there in the end, but no thanks to him. Our waitress, on the other hand, was an absolute dream; very accommodating and totally on it with refills of drinks, which is something that I greatly appreciate as someone whose glass quickly runs dry. 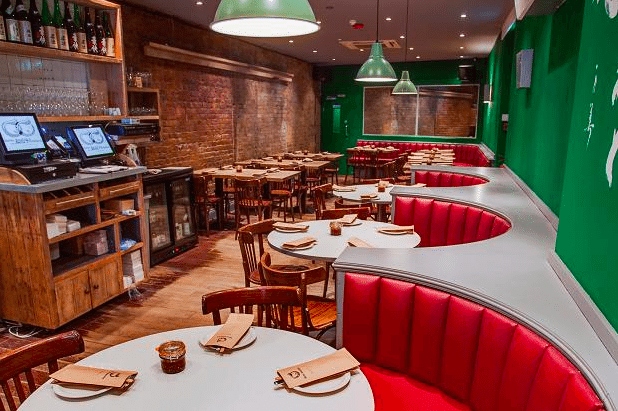 Seating includes booths as well as both low & high communal tables, whilst the relaxed and jazzy interior reflects the style of food served. 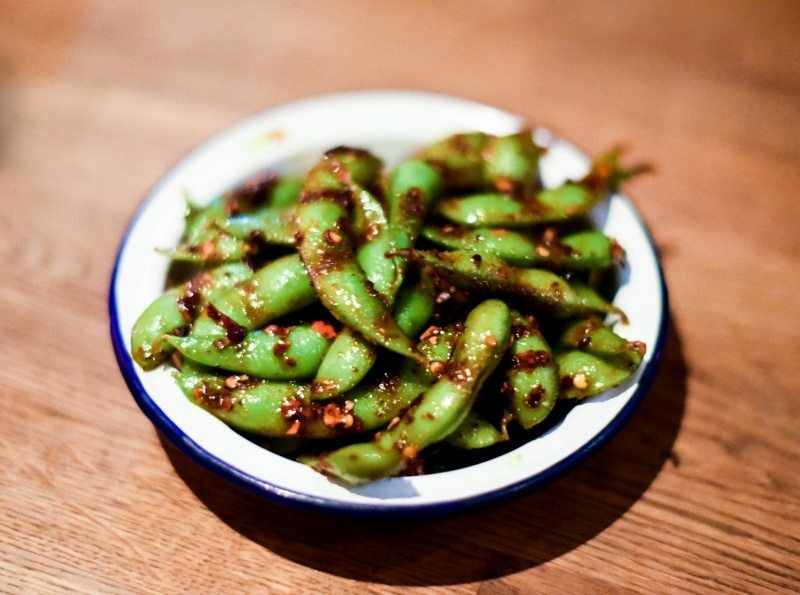 First up on the set menu was the classic Japanese starter of edamame beans, served in a sweet chili soy sauce. For me, these were fab; perfectly cooked and the sauce sweet with small flecks of spice. KFC was next. 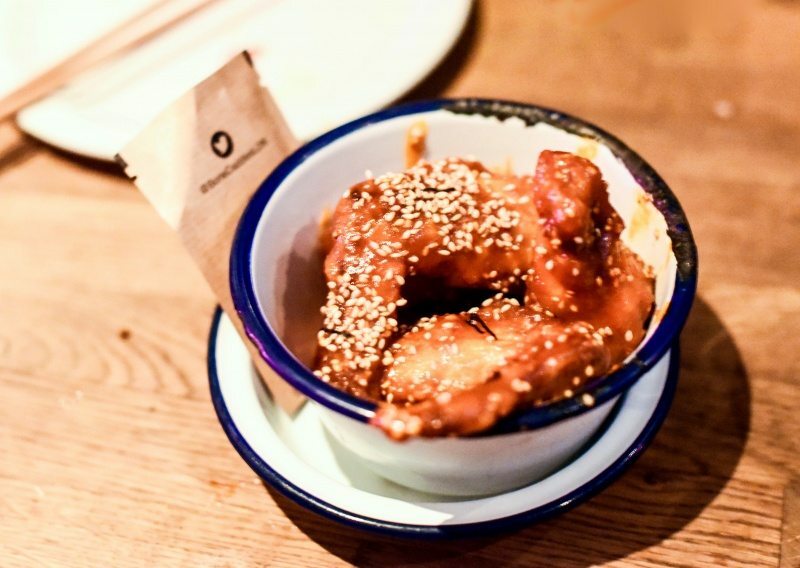 The Korean Fried Chicken wings were sticky and very moreish, and much better than the same I had at Flesh & Buns, though they do become sickly sweet if you have one too many. 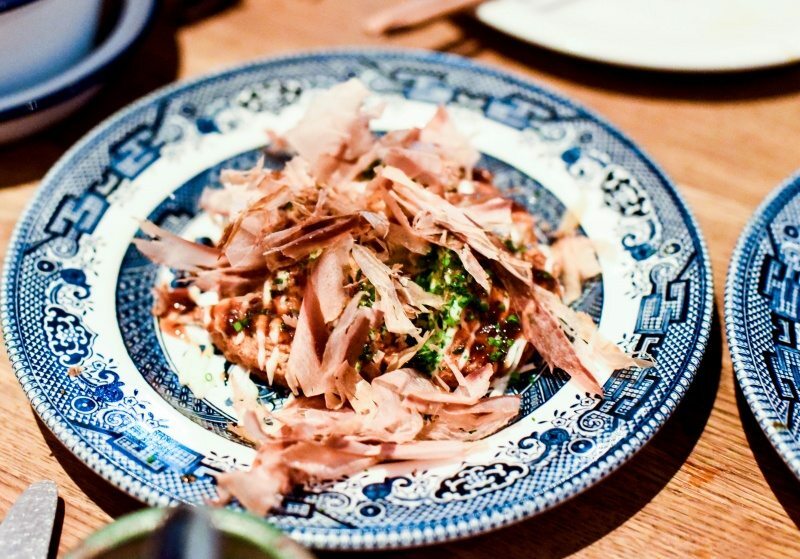 The prawn toast masquerading as okonomiyaki (a Japanese pancake) was an intriguing one. Definitely not your normal prawn toast, with the pieces cut like pizza slices, but really rather delicious and even more so together with the various sauces and bonito flakes sprinkled on top. 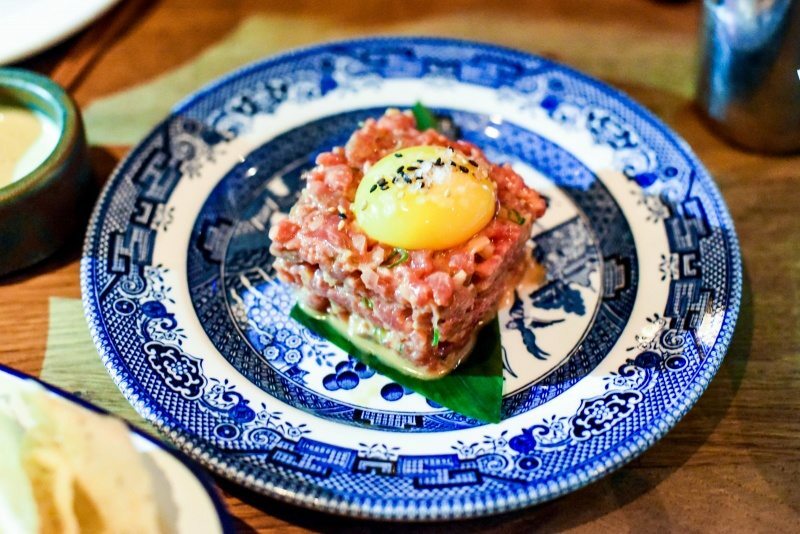 However, it was the wagyu beef tartare with peppered prawn crackers that got everyone really riled up. Big chunks of super soft, well-seasoned meat coated in a runny yolk was my favourite dish of the day. Off set-menu we ordered a couple of the sweet potato fries with shisho mayo (£4.50), as I knew from previous reviews that these were meant to be dreamy. They surpassed expectations. 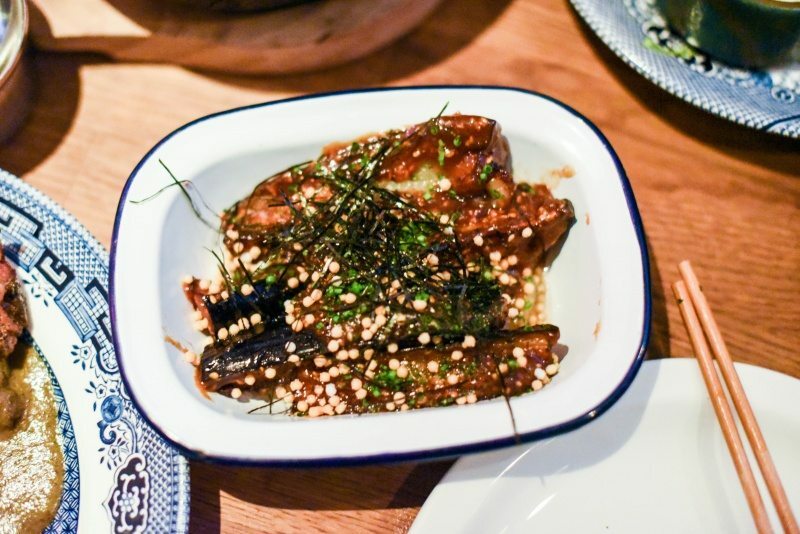 And though the miso aubergine (one of my favourite Japanese dishes) was good, it was a tad too sweet and not nearly as good as Roka’s or Sushinoen’s. 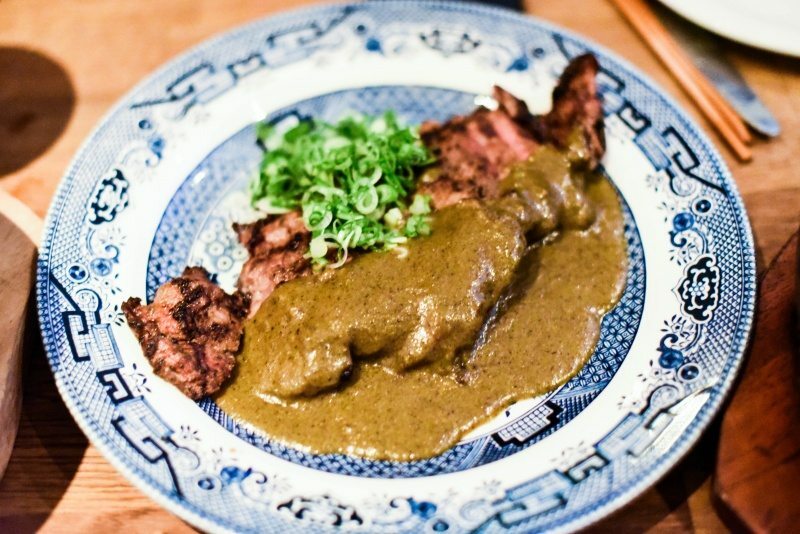 The Iberico pork pluma with black pepper miso and spring onion was seriously good. Thankfully everyone around the table was filling up at a fast pace leaving all the more for me. The pork was incredibly tender and had a great smoky char to it, with the rich peppery miso sauce it was bathing in making it a winning dish for my taste buds. The hot stone rice with beef, chili and sesame was a bit of a misnomer, in my opinion, since I couldn’t find any beef and thought the rice could have done with more seasoning, though I was more than happy to dig out the crunchy burnt bits around the edges. 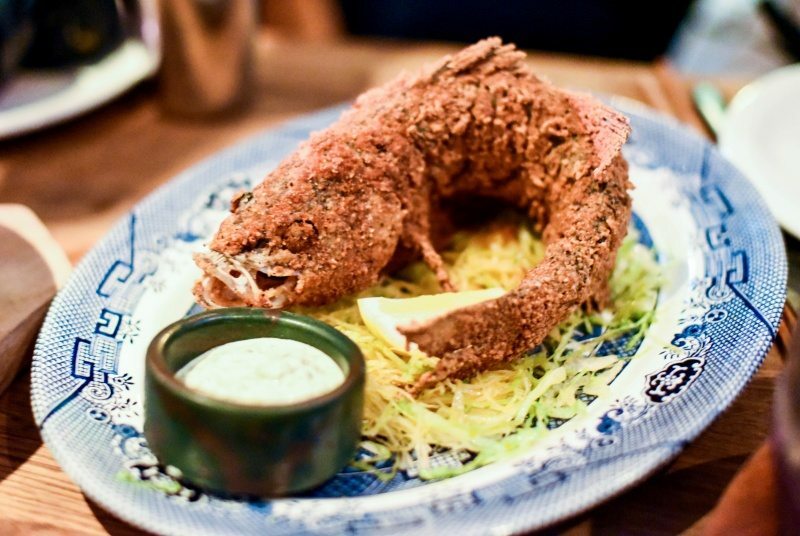 The whole fried seabass looked pretty evil, but thankfully tasted much better, with the contrasting crunch of the skin and juicy, flaky fish it enveloped making it a big hit around the table. And then it was time for the grand finale. 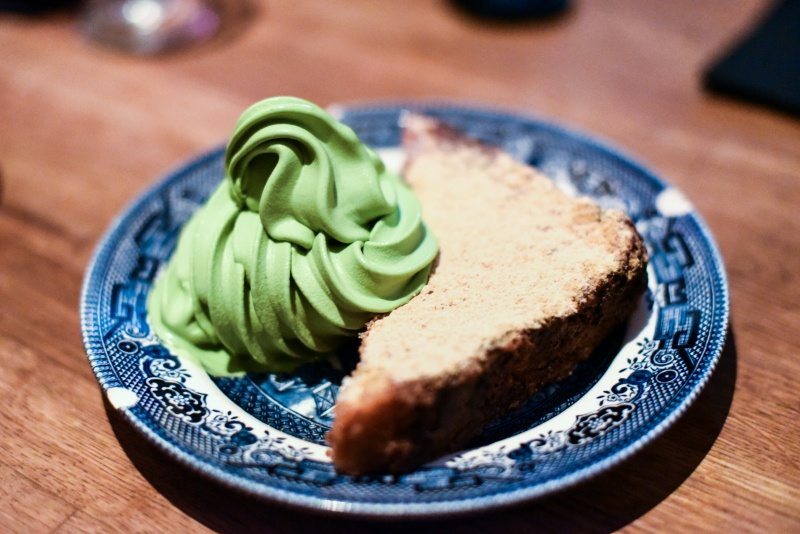 The Insta-famous Kinako French toast with matcha soft serve ice-cream, which completely blew my mind. 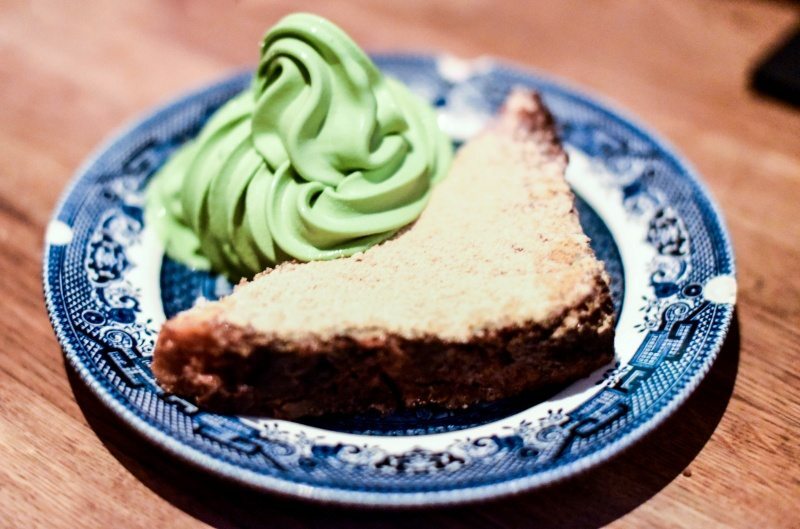 The French toast was pure perfection, with a glazed crunch surrounding doughy fluffy delectableness, and the bitter matcha ice-cream balancing the sweetness and providing contrasting temperature & texture. 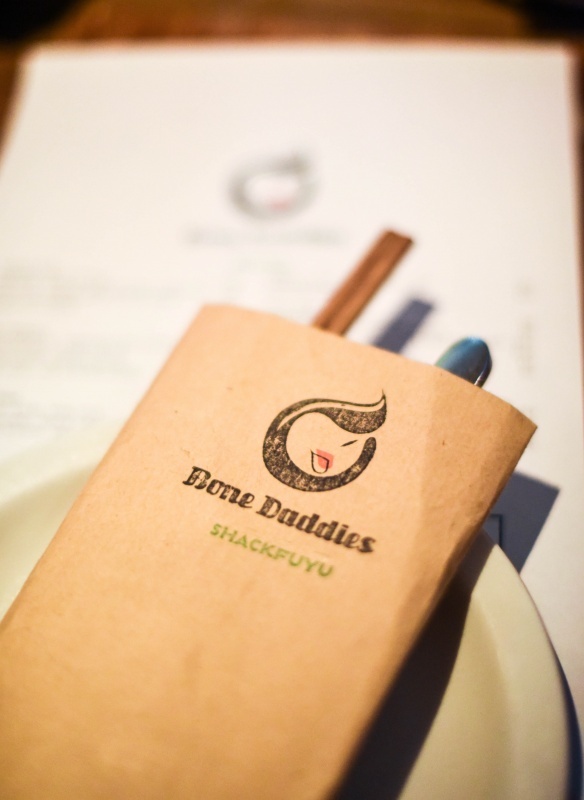 I love my internet friends, and Shackfuyu was the perfect place for our big group date. 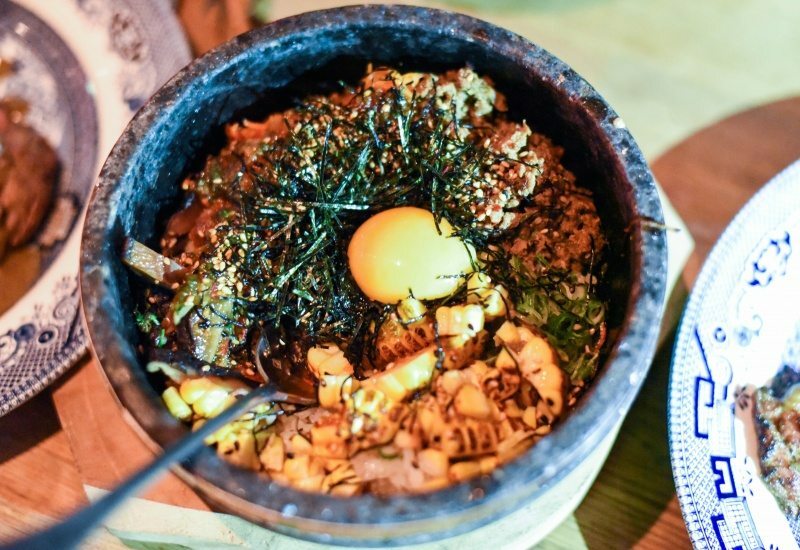 The food is unique and tasty, and very well-priced if you opt for the set menu. I would definitely go back, although next time it might just be for 5 desserts.